PGA Jr. League is shifting the perception of youth golf and the way learned and played. The program brings family and friends together around fun, team golf experiences with expert coaching and instruction from PGA and LPGA Professionals. It’s a game changer, and we’re so excited to offer PGA Jr. League at Christensen Golf Academy (playing the third 9 at Westview), Old Orchard CC in Pittsfield, and River Valley Golf Club in Canton. Registration is $310 will open on around February 1, Sign up at www.pgajrleague.com By March 31. This is the only way to register. Search by zip code 62301 to find the Christensen Golf Academy registration portal. -Two high-quality team jerseys; one orange and one blue (for home and away games). Jerseys are available in boys and girls sizes and customizable with our team name and player’s chosen jersey number! If you have any questions, please contact Mark Christensen, at christensengolf1@icloud.com or call or text me at 2175779790 You can also visit PGAJrLeague.com and follow @pgajrleague on Facebook, Twitter and Instagram to learn more. Practice time schedules are listed at www.christensengolf.com. Match schedules will be posted once we receive our “Pod Designation” from the PGA. Matches will take place in June and July on either Friday, Saturday or Sunday evenings. Practice for the Canton Team will take place at River Valley Golf Course on Fridays, April 26, May 3, 10, 17. Practice for the Pittsfield Team will take place on Saturdays April 27, May 4, May 11 and 18. I am planning on several Quincy Teams: Until I have a better handle on the numbers associated with kids in Quincy, I will not be able to be extremely definitive. Practice for Quincy Teams will take place on Sundays, April 28, May 5, 12, 19. They could also be scheduled for Monday evenings, April 29, May 6, 13, 20. Practice times have not been determined at this point. Times will be announced shortly after the registration deadline. I can’t emphasize this enough. Need based scholarships are available for this program. If your child qualifies for Free or reduced lunch, your child can play for free. If there is an active or retired military veteran in your immediate family your child is eligible for a $75 scholarship. If your family is suffering from a medical hardship you may be eligible for a scholarship. if you qualify for a need based scholarship and your child doesn’t have clubs and you can’t afford them, I will get them provided at no charge. 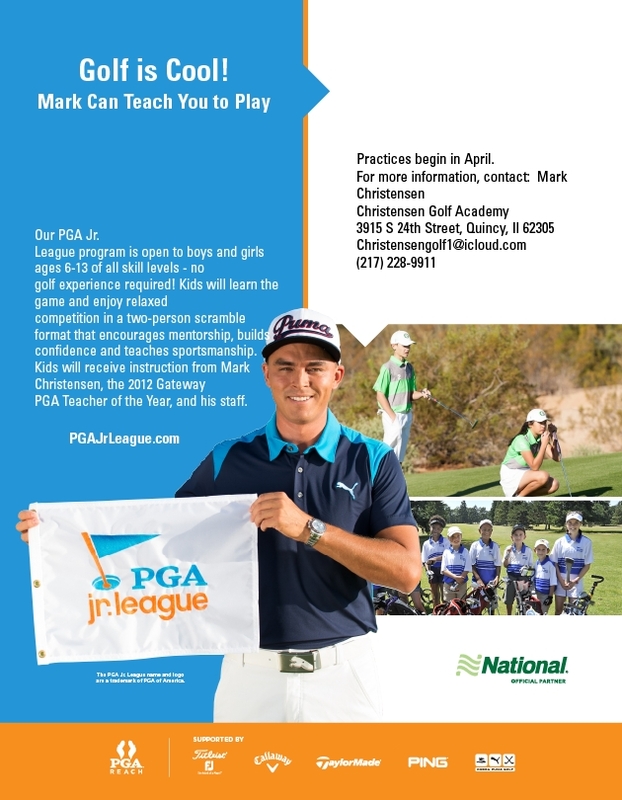 We look forward to a fun PGA Jr. League season at Christensen Golf Academy!